Most people will literally fight with their cat in order to perform a proper grooming session. It’s not really natural for your feline friend to let someone brush him, cut his nails or even brush his teeth. Most people will save the trouble and just go straight to a professional to let them handle the beast. Even if this is a good solution, this can also be very expensive. By following our step by step guide on how to groom your cat at home you should save a lot of money, keep your cat beautiful and healthy, and build a stronger relationship with your cat. You probably already know that cats are amazing self-groomers! They spend an awful lot of time making sure they are perfectly clean. However, despite this natural cleaning habit, our small friends sometimes need a little hand to perfect the grooming. Why: Essential especially for full time indoor cats, keeps them healthy, protects your family and guests, protects your furniture. Why: Beautiful coat, avoid intestinal problems, detect problems, avoid a messy house, bond with your cat. Why: Part of a flea fight treatment or simply to refresh a cat that is a little under the weather and does not groom properly (depressed or sick cat). Well, you got the picture. Grooming your cat is basically taking care of him by providing the care and affection he needs to look and feel his best. The number one rule of grooming is to make sure your cat enjoys it. It will require patience and perseverance but taking baby steps, you will reach your goal. Pick a specific moment during the day and attract your cat in a specific area of your house where it’s both comfortable for him and for you. Start by giving him a treat (or several) in order for him to associate this moment with a positive feeling. At this point, you should not attempt to do anything else. Just welcome him into this new experience. Once you have repeated this for a few days, proceed with what needs to be groomed but always with baby steps. Try to not force your cat but rather ease him into this new experience. It is perfectly ok to only do one paw a day! As long as kitty enjoys it, you will be the long term winner and spend a nice moment with your kitty. For a more in depth explanation, see this complete article dedicated to nail trimming or watch this informational video. Want to know everything about brushing and brushes? Check this out. Remember that this should be a rare procedure and in most cases if you notice your cat’s ear tend to be dirty soon after you cleaned it, you will want to bring him to the vet for a check up. For a more in depth explanation about cat ears, check out this article. Cats usually hate when you touch their teeth, so brace yourself! For more information about cleaning your cat’s teeth, you can check out this thorough article. Want to know more about cat’s eyes, check out our complete article here. Want to know why it’s important to bathe your cat when he has fleas? It’s here! 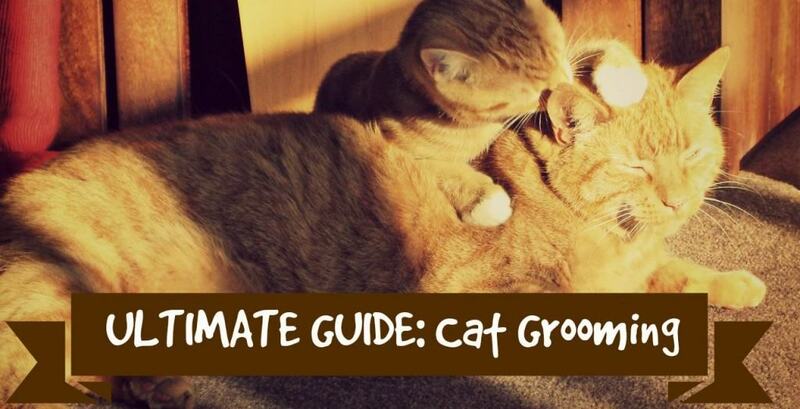 We believe it is simple to understand how to groom your cat at home. Simple and essential! As for everything, starting at an early age makes the process much easier. That’s what we did with our Yoda, especially for the nail trimming part. He is now habituated and is perfectly fine when we do need to proceed and cut his sharp claws. Remember, grooming a cat takes time! Be patient and tolerant with your little friend, do no forget his wild nature if he tries to run away at the beginning. Make it a habit to give him treats to reward him for his patience. Thank you all for following us on Fluffy Kitty, stay tuned on social media for all our latest articles!